Experience HyperIce. Gone are the days of saran wrapping ice packs to your body after a hard workout, game, or injury. Gone are the days of sitting around for 10-20 minutes trying to keep those ice packs on and being unable to do anything else. 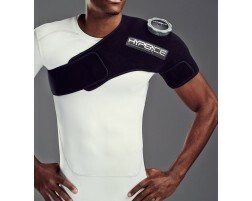 Perfect for on-the-go athletes, HyperIce brings ice compression directly embedded to the brace. With their unique technology, you can now speed up your recovery with cold therapy. Add ice into the patented Ice Cell and place directly into the brace. Wrap the brace around your knee, shoulder, back, elbow, foot, and no longer worry about holding an ice pack in place. The HyperIce devices are designed with an air release valve to help the ice conform to desired body area for maximum cold therapy and compression. Recharge, repair, and recover today. Used by elite athletes Blake Griffin and Lindsey Vonn.